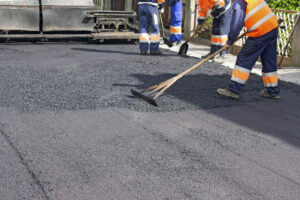 Is it better to resurface or repave your asphalt lot? Here’s what to look for. While the saying might go “never judge a book by its cover”, commercial business owners understand the importance of a nice appearance in bringing in customers. Asphalt parking lots and driveways are factors of a complete approach to the external look of your commercial property. Over time, that asphalt can lose its integrity and you might be thinking about whether to have it replaced. However, just because an asphalt lot is cracking or showing a lot of wear and tear doesn’t mean it is ready for or economical to seek a full replacement. Here’s how to tell whether your asphalt lot could use a resurfacing project or it needs to be replaced. Small wear and tear damage and cracks can be repaired individually, but these are only temporary fixes that will just end up popping up again later. Resurfacing the entire lot is a great way to rejuvenate it as it provides a fresh, 1.5-2-inch layer of asphalt on top of the old lot. All existing damage to the asphalt is repaired before the new layer is put on. Cracks in the asphalt lot less than a quarter-inch wide are filled in with a liquid solution. On the other hand, if your asphalt lot is at least 20 years old or 25-35% of the total surface area requires substantial work, completely replacing the lot is usually more effective. Asphalt is subject to the constant wear and tear of the elements and traffic, and after many years they simply start failing. When an asphalt lot is replaced, it is completely reconstructed from the subgrade layer to the overlay layer. How Long Should an Asphalt Lot Last? Asphalt pavement can vary in its longevity. Factors such as the geology of the soil it is constructed on, the quality of the installation, and the maintenance it receives will determine how long the lot will last. Newly replaced lots should be able to last for 20-30 years as long as it gets proper maintenance and care. Resurfacing an old lot can usually add 8-15 years of life. This entry was posted on Friday, February 24th, 2017	at 4:36 pm	and is filed under Asphalt	. You can follow any responses to this entry through the RSS 2.0	feed. Both comments and pings are currently closed.